​Enough news stories have been done. Enough columns written; enough fact finding and enough of analysis! Both sides of the story been told enough by global journalistic fraternity. But, I write this today not as a journalist. I apologize to my peers for whipping off my journalistic attire for a while. Journalism studies taught me to be unbiased, but I would rather flout that ethics today. I purposely want to be biased today! 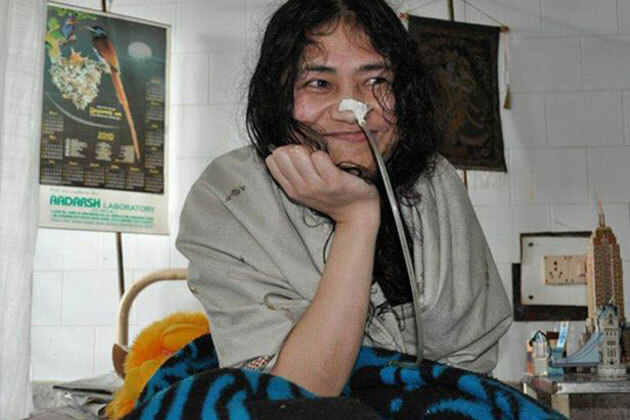 I will tell only one side of the story; Irom Chanu Sharmila’s story. As I pen this piece Irom Sharmila’s relentless crusade against the draconian law Arms Forces Special Power Act (AFSPA) gets older by another painful year. It all started back in 2nd November, 2000. A date which remained a black spot in the history of Manipur forever- Malom, a town situated in Manipur’s Imphal Valley became witness to the infamous and gruesome Malom Massacre. Allegedly Assam Rifles- one of the Indian Paramilitary forces operating in the state, brutally shot dead ten innocent civilians waiting at a bus stop. The deceased included, women, senior citizens and minor. The shrieks, the cries of those ten innocent souls washed away in the gruesome bloodshed. May be it was only the deadly silence of the street, that became evident of the monstrous encounter. The obvious license to this devilish aura was and is AFSPA. Irom Chanu Sharmila, fasted as part of her regular Thursday chores, which she had been following since childhood. However, unlike every other Thursday, her fast never ended and continues till date stretching to 15 years now. Perhaps that barely matter for us. Matters what is proximity? Whilst Anna Hazare’s Hazare’s 12-day fast trembled the nation, sent revolutionary ripples across the globe, Sharmila’s 15-year long battle is lost in the crowd! Sigh! Apparently fighting without having food and water for over 700 weeks now isn’t of much human interest. Most valued nation? Apparently true! Because economy doesn’t take into account human pang. Perhaps in this country currency is valued higher than human lives! But, where exactly the is the flaw? I don’t have an answer. Every year there’s a galore of events to commemorate her crusade. But apart from that, unfortunately we could do much. Stacks of venerated pieces have been written on Irom Sharmila and human rights violation in the region and I am just one among them. All she earned in these years are worthless entitlements like ‘iron lady of Manipur’; ‘the world's longest hunger striker’, Gwangju Prize for Human Rights, Mayillama Award; lifetime achievement award (Asian Human Rights Commission); Rabindranath Tagore Peace Prize; was voted the top woman icon of India (MSN) and the compilation could be endless. But, awards and entitlements merely make any sense! She was aged 28 when embarked on this utter painful crusade and now she’s 43. Sadly, her could be most glorious years of womanhood that perished to oblivion could not change the fate of governance. We can only keep knocking the door; the lock is to be opened by the establishment. May be we can break open the door, but only to be branded as ‘anti-establishment fringe’. This will induce perhaps more ‘prisoners of conscience.’ All that is left for us to do is ride on the virtue of patience till our law makers breed a solution holding discussions behind closed doors over breakfast, lunch and dinner; while Irom Sharmila is force fed nasally!